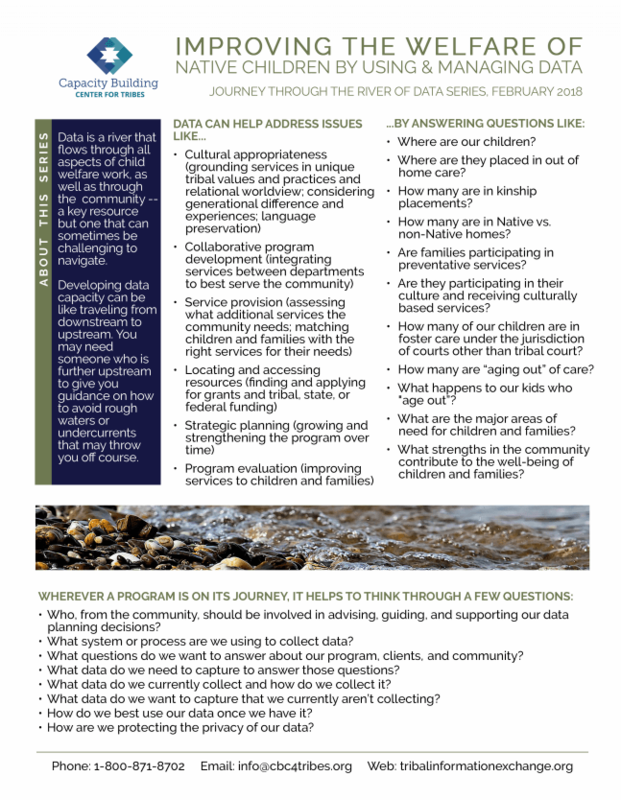 Data is a river that flows through all aspects of child welfare work, as well as through the community – a key resource but one that can sometimes be challenging to navigate. 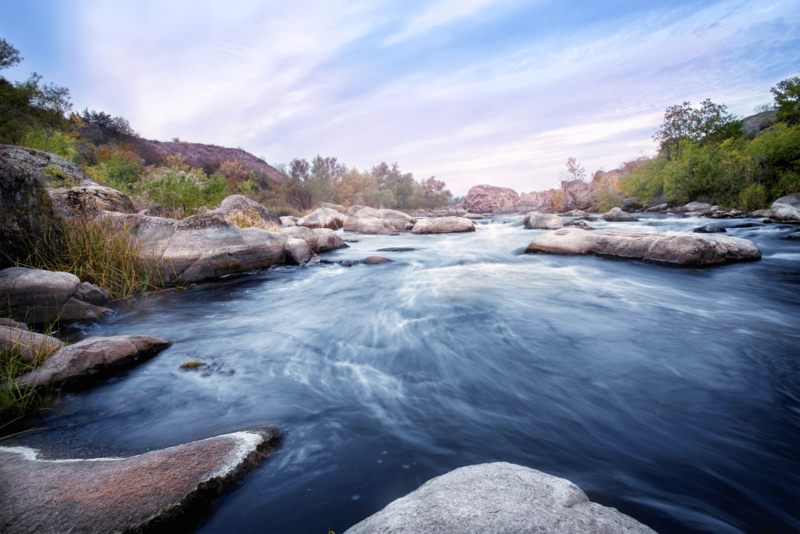 Developing data capacity can be like traveling from downstream to upstream. You may need someone who is further upstream to give you guidance on how to avoid rough waters or undercurrents that may throw you off course. 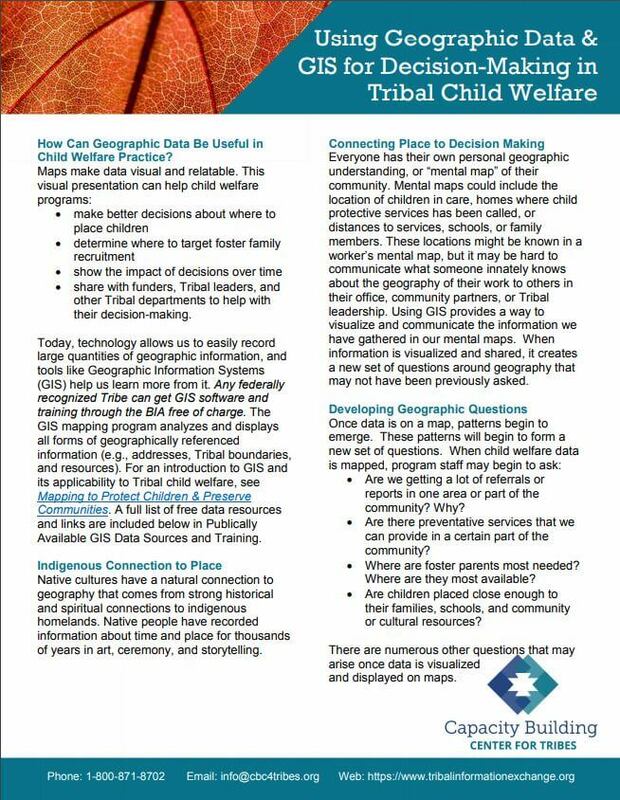 This interactive online learning tool is designed to help tribal child welfare professionals consider how to use data to inform service delivery to children and families and help their communities thrive. Created with busy child welfare staff in mind, these brief documents provide information and issues to consider when developing, managing, and using child welfare data systems. 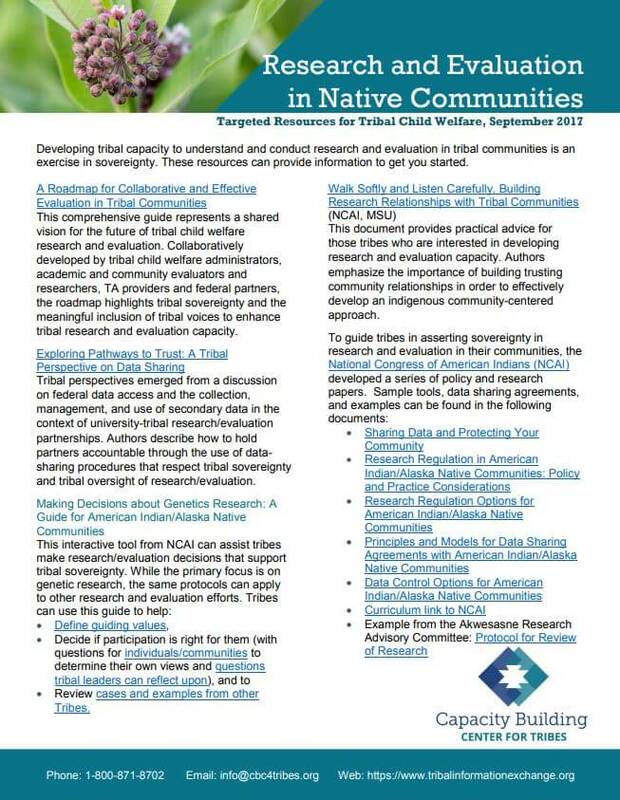 Covering the basics of data, this brief resource includes information on how data can be used to address issues and help tribal child welfare programs thrive. Guiding questions are provided to help programs think through how they want to use and manage data. 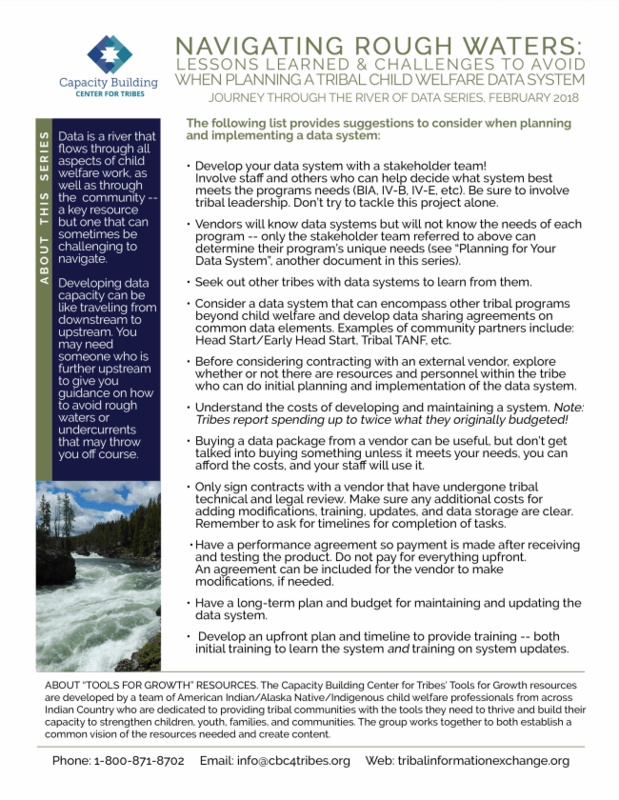 This two-page resource offers concise guiding questions for programs to consider as they develop or enhance a data system. Data needs, program capacity, and readiness for change are highlighted. When programs journey through the river of data, knowing how to navigate rough waters and overcome challenges can make a tremendous difference. 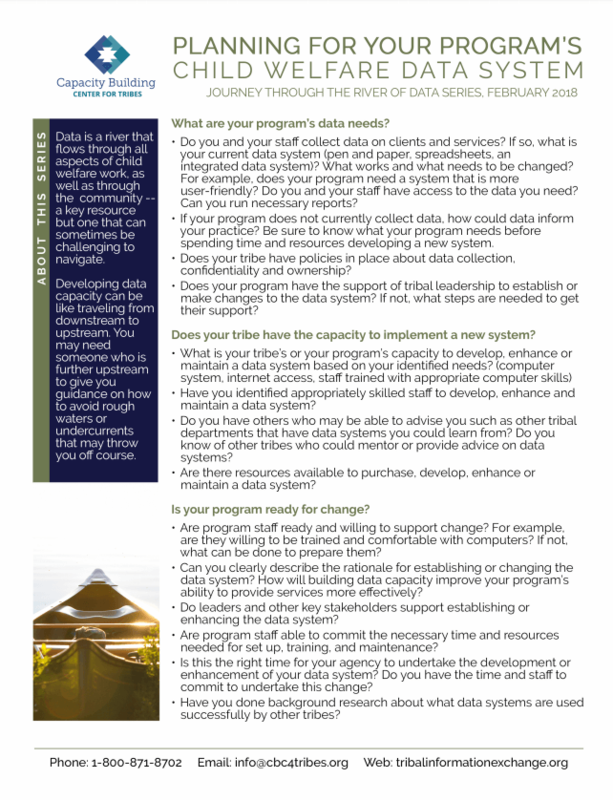 This one-page resource offers suggestions on how to stay on course when planning and implementing a data system. Geographic Information Systems (GIS) are mapping programs for capturing, managing, analyzing, and displaying all forms of geographical reference information (e.g., addresses, tribal boundaries, social demographics), including sensitive or secure data. Tribes have traditionally used GIS for mapping jurisdictional boundaries, environmental resources, and cultural locations. Only in recent years have tribes also started using GIS for mapping health and human services data. 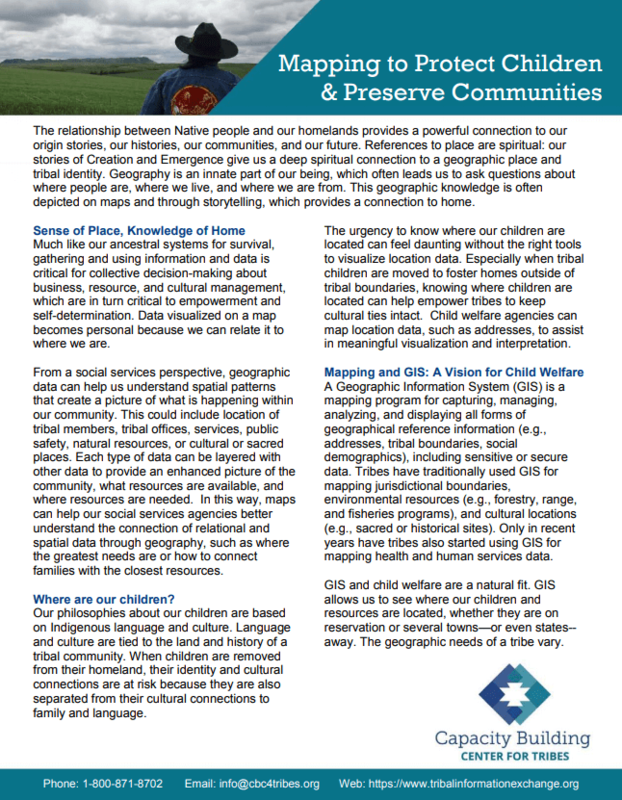 Developed for tribal leaders and social service agencies, this resources explains the benefits of GIS mapping and ways tribes can use this technology to keep children connected with their community and culture. Jhon Goes In Center and Kathryn Kulbiki from the Capacity Building Center for Tribes discuss the importance of using GIS in Indian child welfare in this recorded webinar. In this series of four short videos, Jhon Goes In Center describes the power of using GIS in Native communities. Are you interested in enhancing the way you look at and use your child welfare data? Mapping child welfare and geographic data together can help agencies locate potential foster homes, identify community services, and inform planning, service delivery and decision-making efforts. This resource from the Center for Tribes has lots of information and steps to get you started. Developing tribal capacity to understand and conduct research and evaluation in tribal communities is an exercise in sovereignty. These resources can provide information to get you started.